We believe that Lily bulbs are much better planted in the fall rather than in the spring. 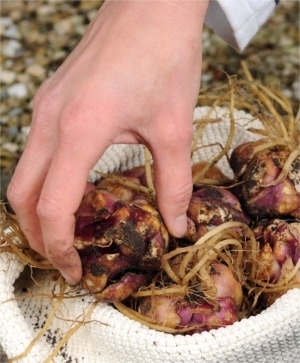 Planted in the fall, the bulbs have a chance to acclimate themselves to your garden and to set down roots. The bulbs will develop more mature roots in early and mid spring before they start to develop a stalk and foliage. If one waits to plant Lily bulbs until the spring, once the ground has thawed and opened up, one would be asking the Lily bulb to grow a stalk and foliage without a sufficient root system. This can cause failure to thrive and long term plant stunting. Lily bulbs that are planted in the fall are among the last of the flower bulbs harvested in the Netherlands. We usually receive them from the annual Dutch harvest in late September through the second week of October depending on the variety and weather conditions over the Atlantic Ocean that may affect transit time. Once we receive and inspect our Lily bulbs, we ship them out immediately to colder areas of the U.S. first. Think about what else will be in bloom in your garden when Lilies flower. 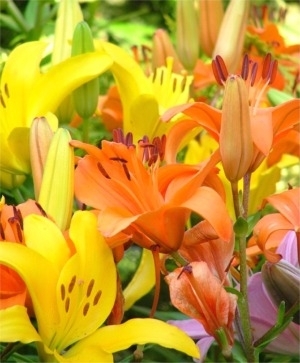 Select Lilies that will complement the colors of your summer perennials. Use the height of Lilies to create structural appeal in the garden whether it be at the back of a border or on reoccurring clusters interspersed throughout the garden. One can also create a wave of Lily blooms: the first to bloom are Asiatic Lilies, followed by Chinese Trumpet Lilies, Orienpet Lilies and Oriental Lilies. Heirloom Species Lilies vary in bloom time. 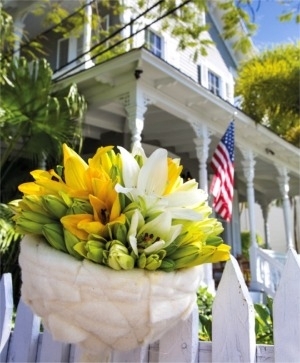 Once established, Heirloom Species Lilies can become the most floriferous and best naturalizers of all. 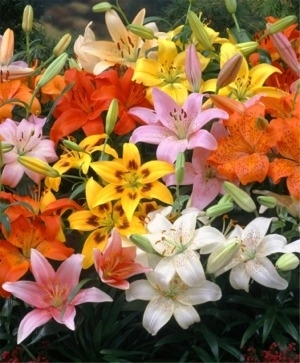 Different colors of Lilies from within one class may be blended into signature mixtures. 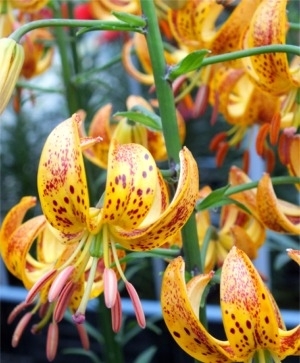 For example, one could blend together yellow and orange Asiatic Lilies for a brilliant citrus mixture, or high contrast whites and even black for a dramatic, rather modern combination. A layered or lasagna planting could also be created while planting different types of flower bulbs in the fall. First plant the Lily bulbs to the proper depth and spacing, then cover them with 2" to 4" of soil to bring the planting depth of Narcissi or Tulips to 6" deep. By doing this, you will have both spring and summer blooming seasons. It's also practical and great fun to coordinate the Lily selection for your summer cutting garden with your interior decor. You'll feel like a floral designer to the stars when you grace your home with the perfectly coordinated arrangements and bouquets. Each type of Lily has its own hardiness zone requirements that should be considered when selecting varieties for your garden. 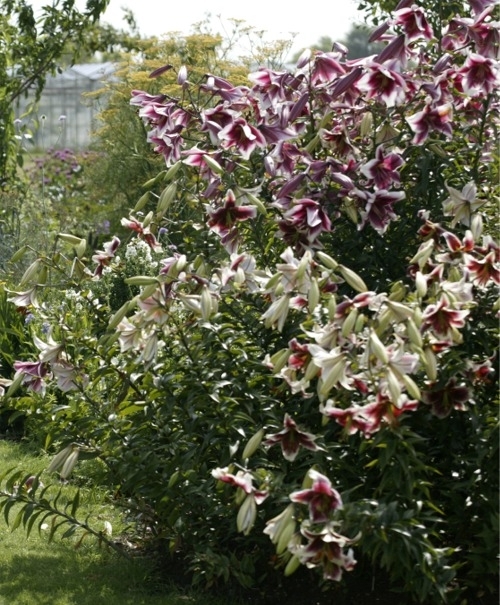 For example, Oriental Lilies are not quite as hardy as other Lilies. If your garden is in a horticultural zone that is either too cold or only marginally appropriate, you may want to apply no more than a 2" layer of mulch after the ground surface freezes in the fall. The mulch should trap the cool temperatures into the soil, not warmth. 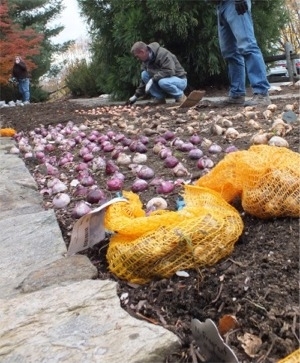 Mulch helps to protect the bulbs from arctic temperature spikes. Good mulching mediums include straw, salt marsh hay or oak leaves. In the spring, you can loosen the mulch in the area in which the Lilies will be sprouting. Mulching is particularly good for Oriental Lilies that are less hardy than other classes of Lilies. Check your shipment against the packing slip and make sure that everything is as it should be. Occasionally, bags of smaller bulbs may be placed in the inner boxes of other bulbs to reduce jostling during shipment. If you can’t find something, open all of the inner boxes. If there is a discrepancy, please call us immediately so that we may resolve it with you. Since every bag or box of bulbs in your order has been scanned using its UPC barcode, we can usually tell you in which box each variety is located. Inspect your bulbs carefully. We make every effort to ship you only healthy, firm, top quality bulbs. Lily bulbs look and feel different than other types of flower bulbs like Tulips or Narcissi. Some have said that a Lily bulb looks a little bit like an artichoke, with so many layers that are known as scales. Depending on the variety, Lily bulbs may have more or less existing roots after harvest. Don’t worry if there are some bulbs with fewer roots than others. Some types of Lilies often have a hole in the top center of the bulb: this is where the prior year’s stalk emerged and came out. It is natural for some types of bulbs, particularly Lilies, to develop a transportation mold. It is a natural gray-blue-green mold that occurs when they are exposed to air, and that disappears as soon as the bulbs are planted. The soil naturally wicks it away. If you prefer, you may spread the bulbs out in the sun, or brush it off with a paper towel although it is not necessary. Little cuts, scars, discolored exteriors and dimples on Lily bulbs are normal marks from the harvesting, cleaning and sizing processes in the Netherlands. The most important factor is the way that the bulb feels. As long as the bulb is firm, it is a good and viable bulb. Some bulbs may already have tiny baby bulbs (bulblets or offshoots) developing on the basal plate (root base) of the bulb while others may even have a little top shoot. Some bulbs are prettier than others, but you can rest assured that all of the flowers will be gorgeous! In general, the Lily bulbs that we carry are sized according to what is the "normal" biggest size bulb for each class of Lily. 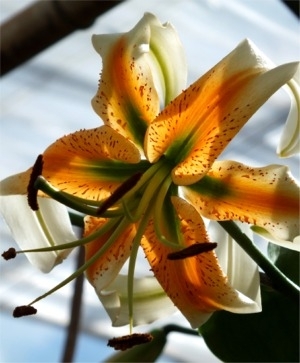 For example, Asiatic Lilies usually make a top size 16/18 centimeter bulb. 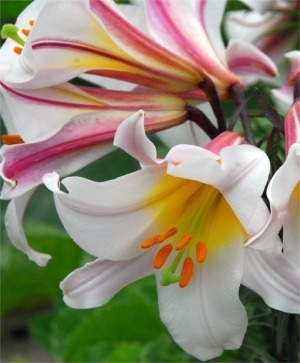 But Asiatic Lily Apricot Fudge, Elodie and Landini grow slightly smaller top size bulbs. After you’ve received your order and inspected it, keep the exterior carton and the inner boxes open to give the bulbs some air. All bulbs love good air circulation. Store them in a cool, dry place with low humidity, away from heat, frost and strong sunlight at about 50°F to 70°F. Never put flower bulbs in the freezer! Poor storage conditions could cause bulbs to dry out, or to become moldy. In general, you’ll need about four bulbs per square foot. Square footage is determined by multiplying the planting site’s length by its width. One of the down sides of planting Lilies in the fall is that Mother Nature can create a timing dilemma. Lilies may be harvested later in the season than we prefer, the transit over the Atlantic Ocean cannot be hastened more than we already do and we have no control over when the ground freezes and closes up across the U.S. in the fall. If you are worried that the ground in your garden may freeze before you receive your Lilies, you may want to prepare the planting site well in advance and keep a black tarp (or cut open garbage bag) over the surface of the garden to soak up the sun’s warmth and help keep it open until your bulbs arrive. All Lilies require neutral pH, well-draining soil. Lilies absolutely hate to get wet feet. The best soil is a sandy loam. For clay soil, break up the clay about a foot deeper than the planting depth of your bulbs and amend the bed with sand and peat moss. For excessively sandy soil, amend the bed with peat moss and aged leaf compost. Please do not ever add horse manure, chicken droppings, mushroom compost or other hot manure or compost to your flower bulb beds. If you would like to add compost you’ve made yourself, please make sure that it is completely decomposed, healthy and neutral pH. Partially decomposed compost can spread fungal disease, such as botrytis blight, and nasty pests. What is good for vegetables is not necessarily good for flower bulbs. People often say that Lilies like to have their heads in the sunlight and their feet in the shade. 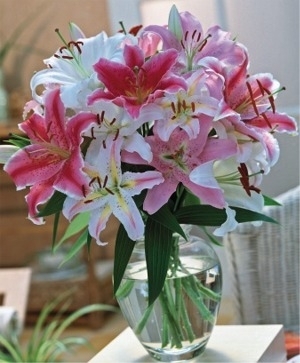 In general, Lilies require more full than partial sunlight due to their height. With full, direct sunlight, even the tallest 6-foot+ Lily has a good chance of standing up straight without being staked. Lily bulbs are easy to plant and are low maintenance. 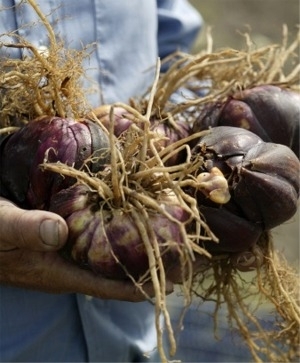 We'll ship you the bulbs in mid to late October after we’ve received them from the annual Dutch harvest. They should be planted after the ground has chilled down to about 55°F, after about two weeks of sweater weather when night time temperatures have hovered in the 40's. As we mentioned above, this is the best time to plant Lily bulbs. Flower bulbs do everything in response to temperature and sunlight. Depending on the type of Lily, the bulbs should be planted between 6" and 8" apart and 10" to 12" deep. Please do not put anything in the bottom of hole that you’ve dug for the bulbs. Nestle the bulb into the hole, fill in the hole with soil to the level of the bed, and tamp down the soil lightly, making sure that individual holes are no longer apparent and that the garden bed surface is level. This will help to prevent water from filling up any of the individual planting holes excessively. Again, all flower bulbs hate to get wet feet. Again, never put anything, including fertilizer, in the bottom of each bulb planting hole. Plant the bulbs to the proper depth and spacing, tamp down the soil and broadcast a 5-10-5 or 4-10-6 granular organic fertilizer over the surface of the bed as if you were feeding the birds. Flower bulbs should never be planted in outdoor containers, window boxes or raised beds where bulbs experience temperature spiking and repeated cycles of freezing and thawing. This results in root growth failure, root system destruction, frozen bulbs and/or bulb rot from poor water drainage. Flower bulbs must have a consistent cold winter temperature with good water drainage in order to produce a mature root system that will permit foliage growth and flower production in the spring. The bloom time listed for each variety is for horticultural zone 5 in normal spring or summer conditions. The warmer the horticultural zone, the earlier flower bulbs will bloom. The colder the horticultural zone, the later flower bulbs will bloom in the spring. Flower bulbs do everything in response to temperature, sunlight and site conditions. Bloom times, heights and colors are approximations affected by temperature and site conditions regardless of the calendar date. If it is a warm spring, bulbs will bloom earlier. If it is a cold spring, bulbs will bloom later. In the event of a mild winter or a warmer-than-usual spring, flower bulbs that have emergent stalks with set buds may bloom early, small and short, although they will likely grow taller and larger as temperatures moderate. Temperature spikes can also affect mature root development, the actual form of the flower or the process of flower color maturation. The most important thing to remember is to enjoy your garden! Create big and little reasons to be outside, hold an annual garden party, take notes on what you love and how all of your bulbs are doing, take photos of where you need to plant more. Once you fall in love with Lilies, there never seem to be enough, no matter how many you plant. Once Lilies bloom, and start to die back, deadhead the Lily to avoid the creation of a seed pod and keep the foliage going until it dies back naturally. A maximum period of photosynthesis allows the bulbs to regenerate for the future. When Lilies are happy where planted, they naturalize by bulb offsets (baby bulbs on the sides of the mother bulb you’ve planted). When you are planting your Lily bulbs in the fall, you may even see the development of little baby bulbs on the bases of some of the mother bulbs. Once the foliage is completely yellowed or browned out, it may be removed from the garden. Once the foliage dies back, it may be raked and discarded. Some thick stalks may need to be cut at the base with a sharp, sturdy tool. 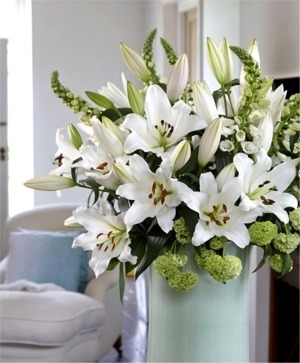 Lilies are among the most popular and widely used of all cut flowers. They offer floral designers a limitless array of possibilities due to the length and strength of their stems, range of colors and range of flower size. 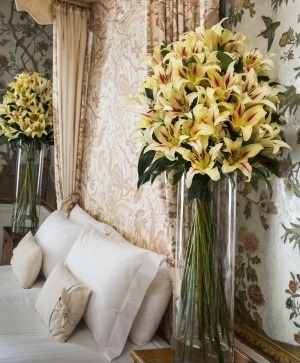 Lilies may be used in tall floor vases for a remarkable, immense display. Just one Lily stem in a sturdy vase can be a magnificent sight. 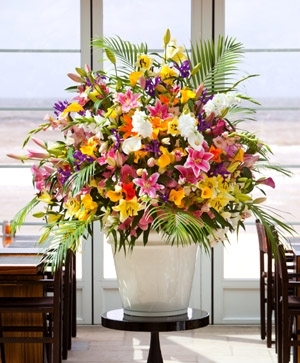 Or, an over-the-top, glorious summer arrangement reminiscent of Newport's Gilded Age can be created in combination with other summer flowers. 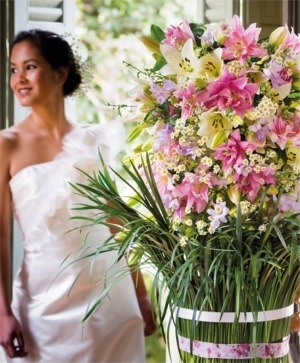 Lilies from all classes are often the focal point of summer wedding arrangements and nosegays. To avoid damaging your perennial gardens or feeling deprived when they are in bloom, it is best to plant a separate cutting garden so you may bring as many of them as you like into the house for opulent bouquets. But if you haven’t planted a cutting garden, don’t worry about cutting a stem from here and there: just leave at least two thirds of the stalk intact in the garden to give the bulb as much photosynthesis as possible for future years of vibrant blooms. If you’ve brushed against Lilies and you’ve gotten a pollen stain on your clothes, we suggest gently pressing a piece of tape on the area to lift the pollen. Then, use a laundry product that contains enzymes to remove any residual pollen. This two-step process has worked the best for us. 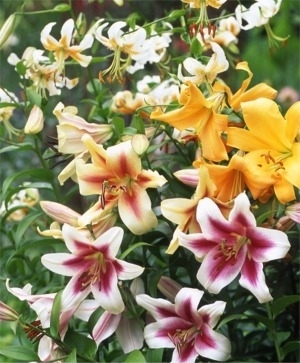 Shorter varieties of Asiatic and Oriental Lilies are good for forcing indoors over the winter. In mid-October, pot them in neutral pH soil, in pots with drainage. Prechill them at a consistent, dark 38°F to 45°F for eight to ten weeks with moderate weekly watering. Bring them into the house~they will bloom six to eight weeks later. Once the bulbs are forced, their vitality is spent and the bulbs may be discarded. If Lilies are yielding more foliage than flowers, it indicates a root system issue. A mature planting may need to be dug up in the fall, and transplanted to the original depth and spacing after carefully separating the bulbs that may have been strangling themselves. It could also mean that there is a hungry deer population that is snacking on the buds before you’ve even had a chance to see them. It is thought that Lilioceris lilii, known as the Lily Beetle, migrated south to the U.S. in 1992 from Canada where it had been imported from Europe on Lily plants or cut flowers (not on bulbs). These 3/8" long, flying bright red beetles perch on Lily leaves, buds, stems and flowers and lay their reddish-orange eggs on leaf undersides from March through June. Develop a daily beetle collection routine: fastidiously flick the easily spotted beetles into a lidded jar half filled with vegetable oil at the beetle stage before they lay their eggs. Do not allow the beetles to fall off the leaves: they always land back down, black belly up, so that they cannot be seen in the soil. Put the jar under the leaf as you remove them to avoid any escapees. Store with the lid on the jar to prevent animals from getting into it or knocking it over. Remove any of the reddish-orange eggs from the underside of Lily leaves and drown them in vegetable oil before they hatch in seven to 10 days: it is the newborn larvae that most devastate Lilies. Both the beetles and larvae eat everything except for the stem, eventually defoliating the Lily plant, leaving only sad little stems. The orange-green to brown larvae protect themselves from horrified gardeners (the only native U.S. predator) with a shield of feces on their backs. This makes it even more unfortunate that the only non-chemical way of preventing their carnage is to physically pluck them from the leaves. If there is enough of the larvae-muck on any one leaf, simply snip that leaf off with gardening clippers. Larvae feed for about three weeks before pupating in the soil for 20 days and re-emerging as adult beetles that ultimately overwinter in soil or plant debris. They are also known to feed on Fritillaria plants. One online report offers hope: there may be an avenging wasp that could be introduced here as a natural predator, but no final word yet. If you are or were unable to remove the beetles and/or larvae, contact your agricultural extension service for suggestions as to pesticides allowed in your state.